If you enjoy spending the summer days out in the sun, why limit your options that you can do this? Here at Country Gardens, we can make your dreams of an outdoor area come true! Our outdoor living areas include seating areas, outdoor kitchens and dining, fireplaces, waterfalls, and many more services! Wouldn’t it be nice to be able to enjoy the warm weather from the comfort of your patio, instead of having to enjoy it through your window? How we start your Outdoor living area? When we design your outdoor living area, we keep your home in mind to have the space be a natural extension. Not only do we focus the details on your current home, we allow full customization of the details within your space. This can include stone, tile, pavers, brick and other items that work well with your current landscape. How would adding your outdoor living area change the dynamic of your home? Even within your home, a fireplace is always a staple for gatherings. Imagine bringing your fireplace outdoors and giving your guests a warm place to sit and catch up during those cool autumn evenings. Or how about having a place for your children to make s’mores without the hassle of packing up the tent for the weekend. You can bring excitement to your backyard with minimal clean up. 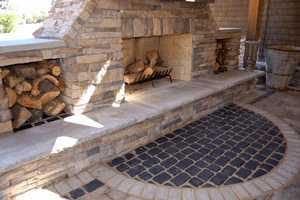 For your outdoor fireplace, you can choose between a convenient gas-burning fireplace or a custom wood burning masonry fireplace. Picture, it now, the fourth of July and your whole family in town to celebrate! Wouldn’t it be wonderful to fire up the grill in your new Outdoor Kitchen, and be able to enjoy the excitement of family around you? Let us take the kitchen outside for you with our outdoor grills and refrigerators! You may be wondering to yourself, what does seating and fountains have to do with each other? Wouldn’t it be nice to enjoy the sound of the steady trickling of water as it cascades down your new fountain while you enjoy the outdoors from the comfort of your new seating area, shaded from the elements? 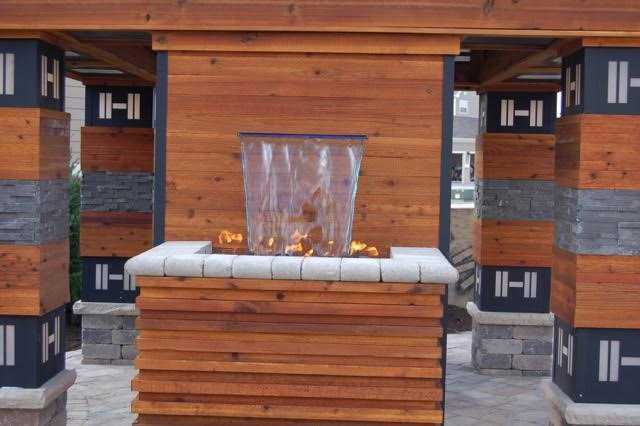 Let’s not forget seating areas for around your new fire pit! Nothing is worse than constantly replacing seating after it has been ruined by the rain, or having to pack them up before the snow. Why not have us build sturdy permanent seating that can withhold the most extreme conditions. Fireplace with seating area for family and friends. Waterfall for added backyard serenity. Outdoor dining area to bring your meals outside. S’mores night with your fire pit, brining camping to the city. Does this spark any imagination for next year’s back yard barbecue? What do the possibilities mean for you? Whatever your dreams may be, stop on in and find out how you can have your perfect outdoor living area! Contact us to get started today!